Bean bag chairs are for kid, right? Not so fast. 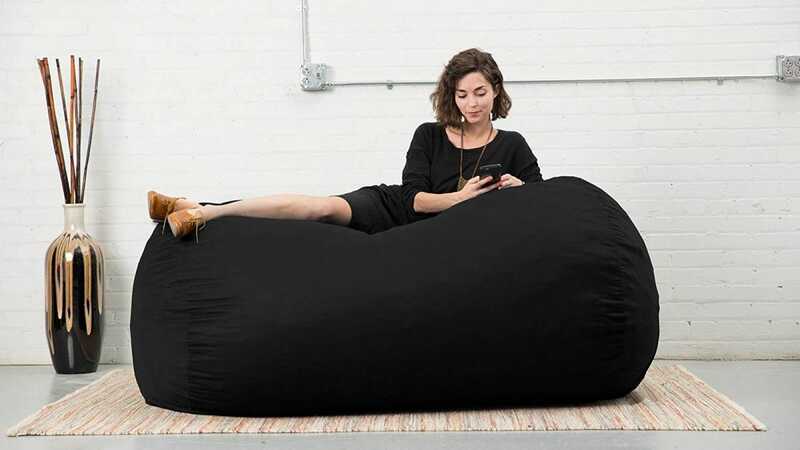 There’s a whole new generation of bean bags built with adult-sized bodies (and comfort) in mind and they’re pretty awesome. Here are our favorite models for serious relaxing. We’ve looked at two different types of bean bags—those that use shredded foam and those that use traditional beans. 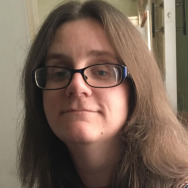 Both filling materials feel very different from each other so, ideally, you want to try them out first for yourself before committing to a specific type. We’ve found that those bags that use shredded foam are typically quieter than beans, but there’s something extra comfortable about using beans instead. Also, whatever you buy, when it arrives, make sure to take it out of the box immediately. The bean bags listed here are packed tightly and usually (like foam mattresses) in vacuum sealed bags. To truly “fluff” out takes up to a few days. Don’t judge them by how they feel on the first day. They need time to spread out. 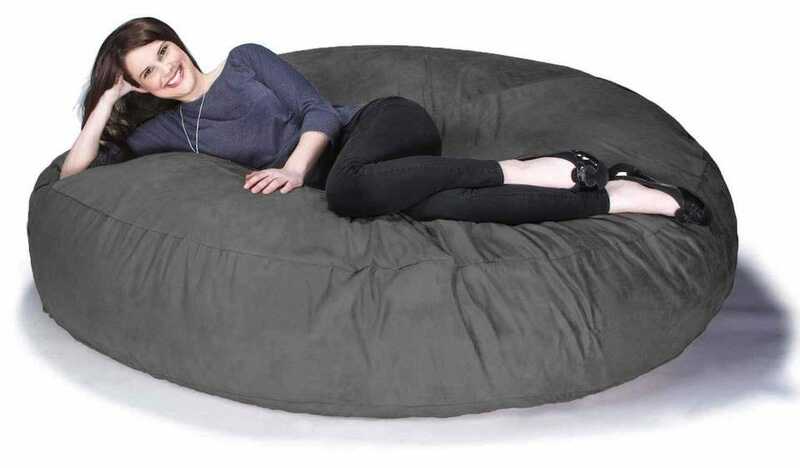 With that in mind, here are some of our favorite large bean bag chairs. 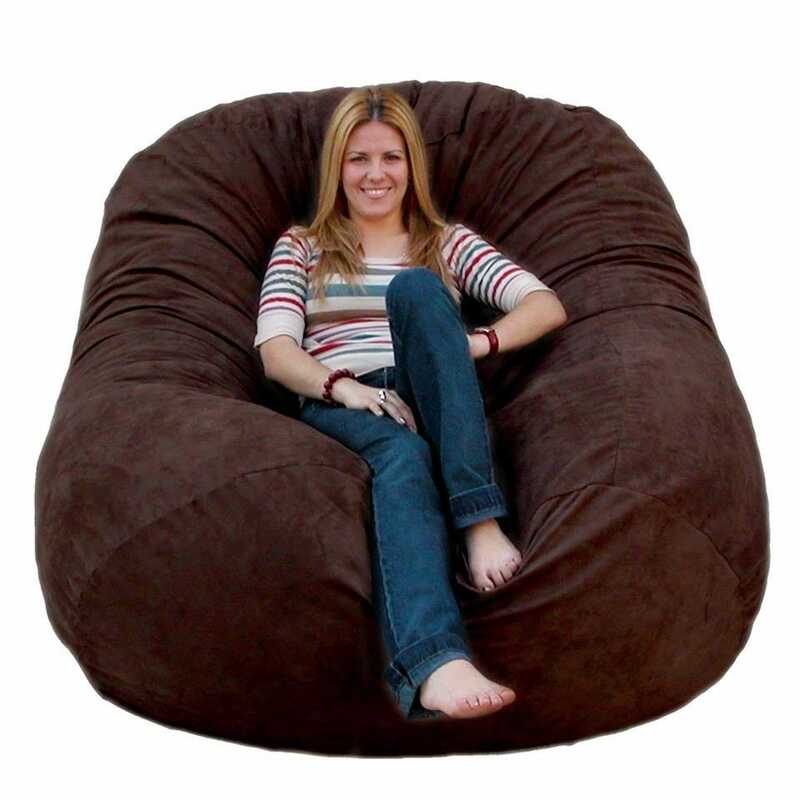 The Cozy Sack 6-Feet Chair looks incredibly comfortable, mostly because it is. Like a giant bear hug, the 6 feet chair is super, well, cozy. It’s filled with shredded memory foam rather than beans, and it shifts easily to conform to your weight and sitting position. It’s designed in a way that means one person can easily rest on it or two can fit snugly together for a romantic and relaxing night in front of Netflix. It has a microfiber cover that can be easily removed and machine washed (perfect for when you eventually and inadvertently drop something on it). It’s available in multiple different colors too, so you can find the right match for your living space. It’s a fun blob of comfort, basically, and a great all-rounder for any situation. 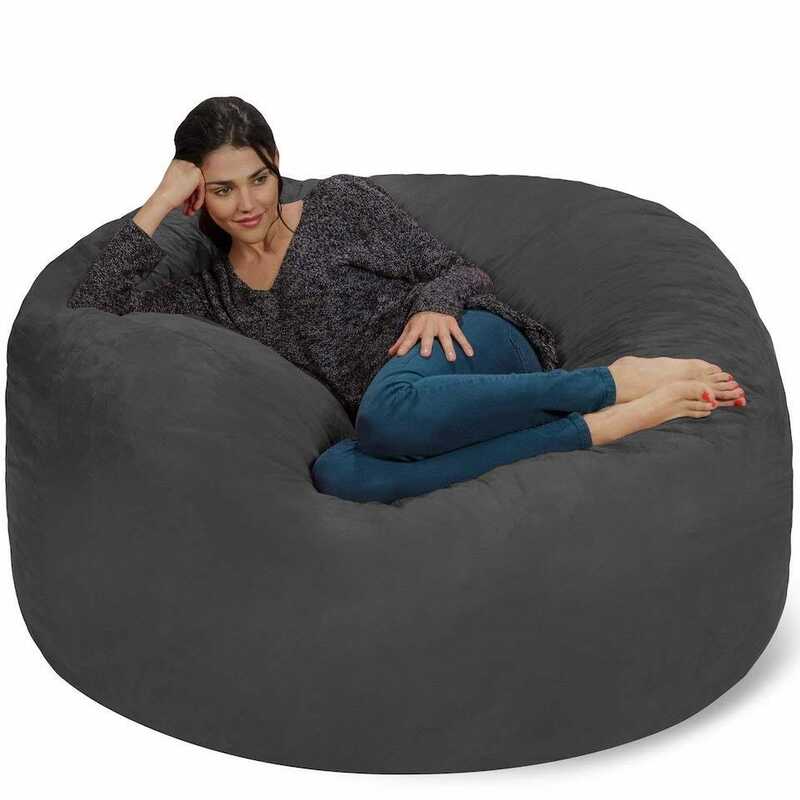 No bean bag chair is whisper quiet but the Chill Sack Bean Bag Chair: Giant 5′ Memory Foam Furniture Bean Bag tries its very best; it’s easily one of the quietest beanbags out there. The bag is stuffed with a shredded soft memory foam blend that ensures it’s durable, quiet, and incredibly comfy. On the outside, a removable double stitched microsuede fiber is used so it’s just as soft where it counts too. Over 25 different colors are available, so there’s something for every decor here. The 5ft variety comfortably fits one adult, or two if you like to be snuggled up together. The moment you buy a giant bean bag, your kids, dogs, cats, and all other pets are going to be all too keen to leap on it. So, you want something pretty hard wearing. The Jaxx 6 Foot Cocoon is perfect for this. 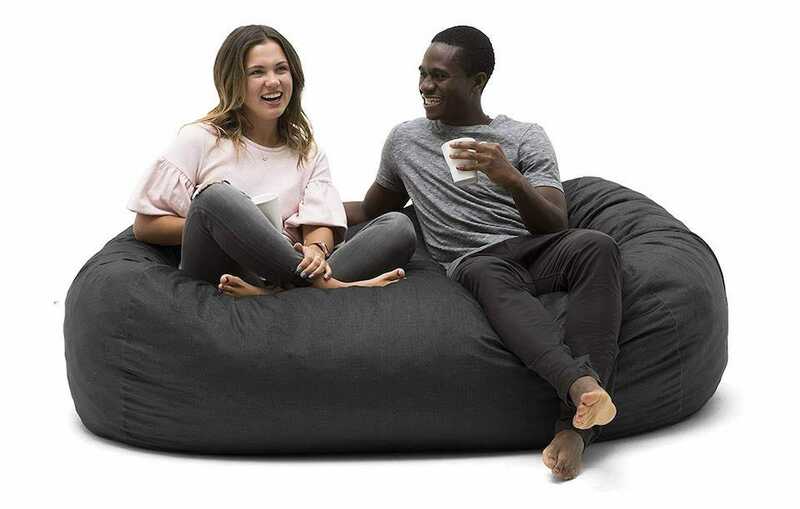 Granted, many of the bean bags here offer similar features such as a removable microsuede cover, but the Jaxx Cocoon’s particular microfiber blend has more than a few fans thanks to how easily stains and hair come out of it. 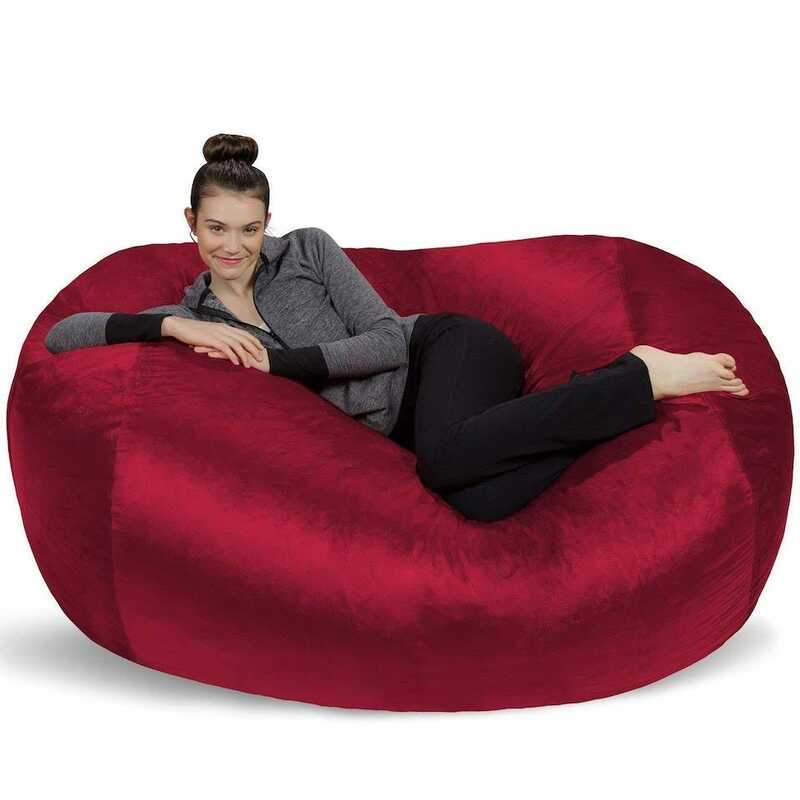 Besides that, it’s pretty flexible as you can choose to place it either lying down like a giant bean bag bed or flip it on its side to work as a massive bean bag chair. There’s plenty of room for you and a friend. You may have noticed that a lot of the color schemes here are firmly aimed at family rooms and games areas. The Sofa Sack Lounger is a little classier—as far as giant stuffed furniture goes, anyway—and could look pretty good in a more mature setting. The innards are made from shredded memory foam, with the outer lining made from velvet passion suede. Double stitching means it’s pretty durable too. That’s lucky as the cover isn’t removable so you need to be prepared for spot cleaning sessions. Still, if you aim to use this for a more modern adult living room, that’s not going to be much of an issue. It’s great for two adults to cozy up on. Many of the bean bag chairs here are pretty tough to move around. After all, they’re designed to be sofa replacements so once they’re fully unpacked and fluffed up they’re a bit of a bear to move. The Big Joe Media Lounger is good for dragging around if you’d like to use it in more than one place or move it easily, though. It’s surprisingly lightweight and includes handles so you can move it around really easily. Despite being lighter than others, it’s still very comfortable thanks to the shredded foam stuffing. It keeps rather cool too so you won’t burn up during the summer. Just expect to fluff it up every once in a while if it starts to lose shape as it’s not as tightly packed as its heavier counterparts.